The time had come for us to bid farewell to Las Vegas. After a quick trip to McCarran and a not so quick 2 hour wait before boarding, we landed in Portland. To contrast the glitz and glamour of the Wynn, we had chosen The Heathman Hotel. After settling in, we decided to stroll around the neighborhood, just to get a feel for the city. Not more than 3 blocks away, we saw a corner restaurant called Higgins. It looked fantastic and we were looking at the menu, when a hearty local came out of the restaurant and struck up a conversation. It soon became apparent that this man knew his town and he knew his food. He informed us that Higgins is consistently rated as one of the best in the nation, and that we should save the Heathman restaurant for breakfast. It has been three weeks since that happened, and I can’t recall our logic, but we decided to forgo the advice and have dinner at the Heathman. I do not regret that decision at all. The Heathman has taken the classic approach to a restaurant, full of clean lines and white walls. I did enjoy that the kitchen seemed to be a part of the dining room with just a section of plate glass as a divider. The wait staff was attentive and more than happy to accommodate our requests. Often overlooked, the bread and butter of a restaurant is often a litmus test for the restaurant. 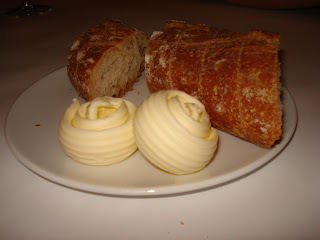 This was a rich butter that nicely complimented a rustic whole wheat bread. However, it complimented the escargot persillade even better. 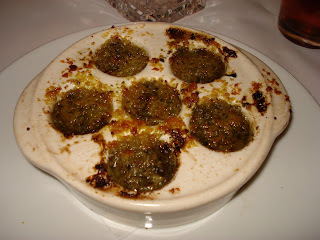 After the half shod attempt at Mon Ami Gabi, I was eager for a quality plate of escargot. This did not disappoint, with a superb balance of garlic and herbs. Now that we were in a coastal state, we had to take full advantage of the seafood. For us, that meant oysters. 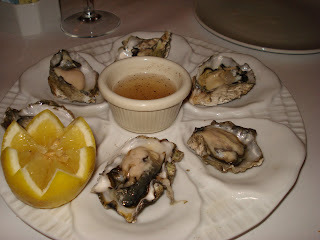 I personally don’t really enjoy the big oysters of the gulf coast, much preferring tiny oysters with a subtle briny taste. 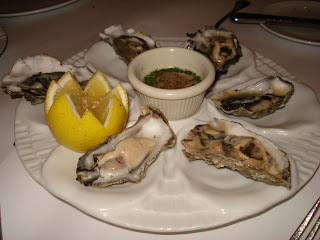 These kumamoto & royal miyagi oysters fit the bill perfectly, especially with the lemon vinaigrette. 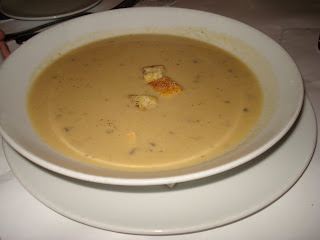 Just to be different, my father decided to order the soup of the day, a sublime potato and leek soup. I had to sneak a taste, and I was beginning to think I had made the wrong decision with the escargot. A quick dip of the bread in the escargot dish reminded me that I had chosen well. For our entrees, the three of us had all chosen a nice meat dish. My mother led the way with kobe beef on a bed of chanterelle & oyster mushrooms. 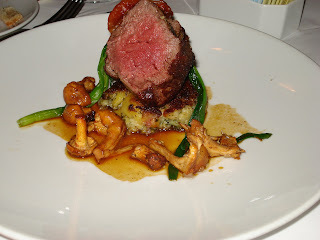 Next up was my father, and he decided on the seared elk tenderloin. There was a reason he chose this dish. I wanted to try both the elk and the lamb as did he, so we compromised and traded some of our dishes. 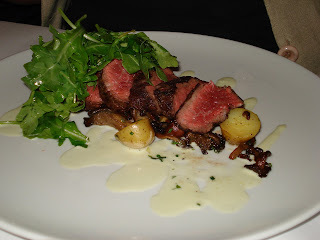 The elk was very nice, though I’m glad I chose the lamb. They couldn’t just call it roast lamb, no, that would be too simplistic. 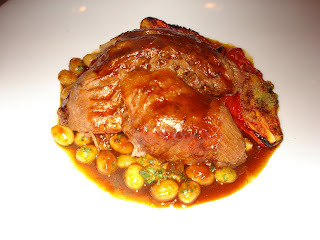 That was a minor gripe, they had to call it gigot d’agneau sept heures. Granted once I tasted it, I could care less what they called it. You would think that amount of food would have been plenty, but no, our waiter was too damn persuasive. They also had a badass dessert menu. 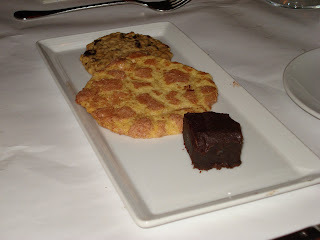 That is a snickerdoodle, a chocolate chip cookie, and a brownie, together they formed the cookie plate. Something my father claimed would be for later that night. Very little survived. My mother had some sort of cake or pudding, I can’t make it out from my shoddy photography. I went the opposite route and enjoyed some fine cheese. The first cheese is a chimay, le poteaupre from the abbey that brews that iconic beer. It was a stellar cheese with a full flavor but not overpowering flavor. The other was a pierre Robert bloomed rind cheese, and you can actually see the vein of truffles running the length of the slice. 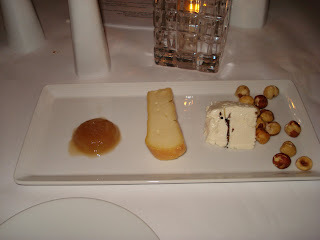 I think I came out better with the cheese than any of the sweet things on the menu. The Heathman was an absolute pleasure and we would patronize for breakfast before we left. There wasn’t a thing that I could really complain about, and I love it when the restaurant gives you a copy of the menu. Did you really think I could remember all these details?